It’s become a common refrain among travellers trying to book flights on points: they can’t get seats because airplanes are all packed or because of blackout dates. Two Aeroplan members recently went to CBC’s Go Public after finding it nearly impossible to use their points to book certain flights. Toronto’s Michael Finkelstein, who’s been collecting points since 1992, told the public broadcaster he tried using his miles to book a trip for himself and his wife to Europe. He started looking in February of this year; nothing was available until March 2016. Finkelstein claimed that a supervisor told him that the company has grown so much that it can’t get the space allocation from airlines, thereby finding itself unable to meet customer demand. Ian Gill from Huntingdon, Que., meanwhile, complained that he couldn’t find business class seats 11 months in advance and that the Aeroplan fees associated with an Air Canada flight were exorbitant. With more than 80 travel reward credit cards available to Canadians, picking one—never mind the “best” one—can be a daunting task. The trick to getting the most bang for your rewards-card buck is to pore over the fine print before you even sign up, says Patrick Sojka, the founder of Rewards Canada. “You need to find what fits with your travel patterns: where you want to travel, how often you travel, and how you spend your points,” Sojka says. “It’s all about what works best for you. “No-fee credit cards don’t reward you very much, but there are some people who are just absolutely against paying an annual fee on a credit card, or they don’t need the insurance benefits that come along with those cards, so a no-fee card works for them,” he adds. Sojka says while there are many tales like those of the two Aeroplan members who went to Go Public, he hears positive accounts from travellers far more often. He has certainly figured out how to work the system himself. Last summer, he flew out two family members from Regina to Calgary on short notice; he starting looking at flights available through his Aeroplan program at11 in the morning; the two were a plane later that same day. There were some taxes to pay, but had those seats been booked directly with the Air Canada, they would have cost close to $900 each. He booked a more recent family to San Diego with his Diners Club MasterCard for a cost of about $800. Had he booked the four seats directly with West Jet, it would have cost $2,500. Sojka recommends having an American Express, a Visa, and a MasterCard, one as your main card with the other two simply on hand; having all three types means you’ll have access to deals no matter what. “There are promotions on things like airlines or hotels specific to a credit card brand,” he says “I just received a mailer from Amex, where you get a $100 credit if spend $500 at Marriott hotels….Visa used to run promos of 10 percent off Air Canada flights. I’m not saying drop Aeroplan or Air Miles because you’re going to be shopping anyways. But maybe you’ll end up booking a flight via BMO rewards then use your Air Miles for Disneyland tickets. This one takes the crown for offering two percent return on all purchases that can be used towards any travel that is booked through BMO Rewards and a 30,000 point sign-up bonus that is worth $300 of travel, among other perks. You get two reward miles for every $1 and 10,000 bonus reward miles with your first purchase, a value of up to $100. There’s a 1.5 per cent return on all purchases plus a 4.5 per cent return on travel booked via Expedia for TD Rewards that can be used toward any travel via any booking method. Card holders can start redeeming at 10,000 points or about $3,333 in spending. This one has bonuses of 1.5 points on eligible spending at gas, grocery and drug Stores plus additional bonuses at CIBC bonus reward partners as well as out of province medical coverage. 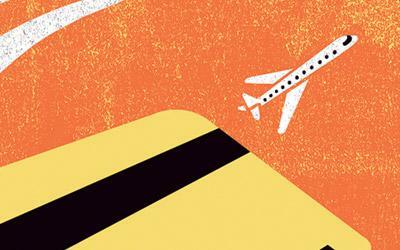 Meanwhile, Credit cards.ca has its own ranking of the best airline credit cards. This is the same one that appears on the Rewards Canada list. You get two reward miles for every $1 on all purchases and a bonus of 10,000 reward miles with your first purchase, a value up to $100. You earn 30,000 bonus points after your first purchase, equivalent to four free nights certain hotels, plus five points per $1 spent at participating Marriott locations. Here’s another card that made it onto both lists. The first time you use the card, you get a bonus of 500 Air Miles; from there its one reward mile for every $15 in card purchases at Air Miles sponsors and one reward mile for every $20 in purchases elsewhere. Are there any cards to steer clear of? Rewards Canada’s Sojka is hesitant to describe any of them as “bad”, but he says one that doesn’t make much sense for him is the RBC Shoppers Optimum MasterCard. “A lot of people like it because they like to shop at Shoppers and can redeem points there,” Sojka says. “Outside of shopping at Shoppers, you get half percent [cash] back. But you could get a cash-back card that gives you one per cent back, and you’re earning double.